Cutting edge technology, AR9030T Receiver, touch screen, WI-FI & Bluetooth! The Spektrum iX12 is an intelligent 12-channel radio system matched with a powerful combination of features and next-level connectivity. 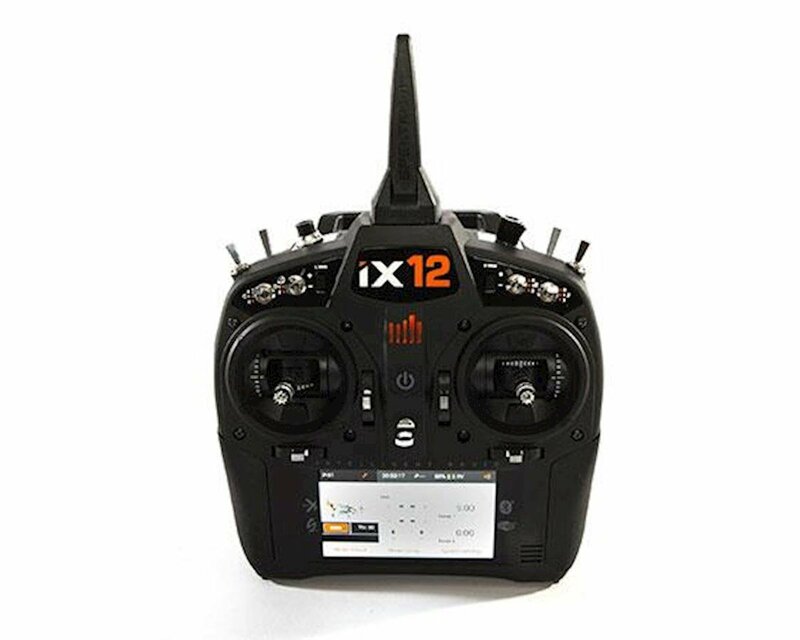 Groundbreaking yet comfortably familiar, RC pilots of all aircraft types can use the iX12 to out fly everything in its class. "Tap" into the iX12's programming - litterally! Its 4-inch, full-color, easy-to-read monitor delivers crisp, clear detail that includes state-of-the-art touchscreen technology so that navigation is simple. And, because the interface is a fully functional Android system with a dedicated quad-core processor, it will work with an evolving list of apps from the Google Play store. Absutely awsome. Hands down the best transmitter out there. It is different than what you have used before but in a good way. It does everything and more than advertised. If you can use a smartphone than you can use this. Importing models from any g2 radio is simple and easy. It is a little confusing at first but once you connect to wifi and update the airware you are good to go. I like that you can set your model then switch screens and go to android and use your apps. The model stays active and now you are surfing the web playing music and so much more. When you turn off the unit and turn it back on it's automatically on your last Model even though the Android screen is showing your transmitter is now active. I also like the standby mode you can place your transmitter in standby instead of turning it off and having to reboot. The reboot process does take about 2 minutes for Android however your air where is running in the background and still comes on immediately. I have only scratched the surface of what this thing can do. The other nice feature is that the programming is the same as all the other Spektrum platforms. The only difference is it's a touch screen. So no real learning a whole new system. Also when you activate a monitor you can tell it how many channels to monitor instead of having all 12 active and you're only running a 6 channel receiver or such. And for those of us that have way too many toys you can sort your models by type when looking them up in the screen instead of having to scroll through 50 or 60 models. You can tell a lot of thought went into designing this platform. And the best thing of all is that it is upgradeable so as new versions of firmware come out it is easily downloaded through Wi-Fi. No more cables and SD cards and copying and pasting. Simple upgrade and simple Android platform. Also horizon suppprt has a whole series of instructional videos to support the use on youtube. Just sum it up if you're looking for a great radio and are a tech savvy person this is a radio for you. I could go on and on but so far I have nothing bad to say about this radio.